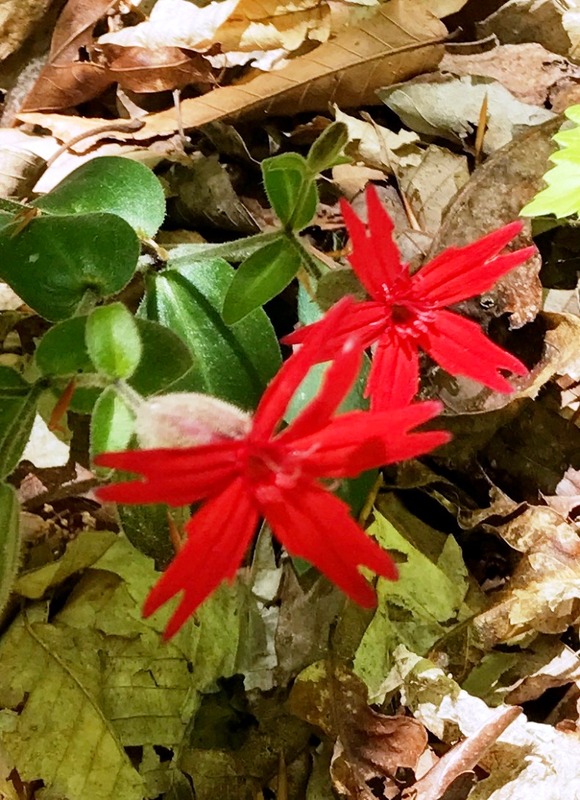 Despite being red, Silene species are in the pink family, the Caryophyllaceae. A characteristic feature of many genera in this family is the cleft petals that you see in the image above. Chickweeds (Stellaria spp.) and carnation (Dianthus spp.) are also in the Carophyllaceae. To complicate naming matters, the term “campion” (and I don’t mean Jane) is a common name for other species of SIlene, such as S. vulgaris, or bladder campion, that is a frequent volunteer in my back field and a common rock garden and bankside flower, C. acaulis, moss campion, as well as species of Lychnis. Campion’s is also apparently a pizzeria and Italian restaurant in South Windsor, Connecticut. So many pizzas, so little time. I have loved fire pink for 50 years; what I just learned is that a preferred pollinator is the ruby-throated hummingbird. Do not pick this pink; it is endangered or threatened in a number of states. Oh, by the way, the arborist and photographer of the fire pink above is Carrie Paulus of Horticultural Concepts, Inc. of Mogadore, Ohio.